HPANWO: Was the Titanic Scuttled? I’ve often been accused of being a “Conspiracy Nut”, somebody who will believe any crazy story that I hear. I certainly take seriously many stories that most other people I know would call “crazy”, but this is only because I think there’s good reason to consider them true. If I think there’s good reason to reject them I shall do. There are many so called Conspiracy Theories that I do not believe in, even though many of my peers do. A good example is the rumour that when Apollo 11 landed on the moon, mission control edited the reports that Neil Armstrong and Buzz Aldrin sent back to Earth because they found UFO’s and aliens living there on the lunar surface. I don’t think that this is true? Why? Because I don’t think Apollo 11 ever went to the moon; see: http://hpanwo.blogspot.com/2009/01/i-went-to-godamn-moon.html . There’s a popular contemporary Conspiracy Theory circulating at the moment on the Internet about one of the most tragic and fateful incidents in history: The sinking of the RMS Titanic, the most famous shipwreck in the world. One of the pioneers of this theory is an author from Oxford, Robin Gardiner. He wrote a bestselling book entitled Titanic- The Ship that Never Sank, see: http://www.amazon.co.uk/Titanic-Ship-That-Never-Sank/dp/0711034869/ref=ntt_at_ep_dpt_2 . At the time Titanic set sail on her maiden and final voyage she was the largest ship in the world. She was a purpose-built transatlantic liner of 882 feet in length, 92 feet in beam and with a draught of 35 feet. Her gross tonnage was 46,328. Despite historians raving about her size and splendor she was not a unique ship and was in fact the second of a class of 3 vessels of which she was not even the name-ship, the Olympic-class liners. 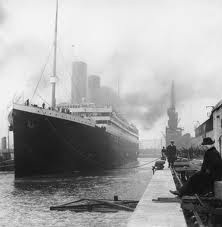 Her sister ships, Olympic and Britannic were in drydock at the Harland and Wolff shipyard in Belfast, Northern Ireland at the time Titanic set sail and Olympic had already been launched and commissioned two years earlier in 1910; her visit to Belfast was for a refit. These ships were only slightly bigger than their main rivals, Cunard’s Lusitania-class ocean liners. (Lusitania became the victim of what I suspect to be a 9/11-style false-flag operation in 1915 which I may well write about in a future article.) What follows is one of the most renowned and poignant tales in maritime history. Titanic set sail from Southampton on the 10th of April 1912; within a few hundred yards of her dock she had a near-collision with another ship, ironically this would have probably not resulted in human danger, but would have scuppered the entire voyage and saved 1517 lives. She crossed the channel to Cherbourg in northern France and took on more passengers and then headed for Cobh on the south coast of Ireland, in those days called Queenstown, where a large gaggle of poor Irish immigrants embarked. Titanic then began her transatlantic crossing heading for New York. On the night of Sunday the 14th of April the weather was very calm but freezing cold. Titanic sailed along at 18 knots, above the speed limit for ships of her type at night. This was despite radio messages coming in from other vessels warning of icebergs in the area. The North Atlantic Ocean fills with icebergs in the spring when the polar icecaps melt after the winter. This is not a problem for modern ships which have radar, but in Titanic’s day there was no way to face the danger of icebergs except to post lookouts to try and spot them ahead. At 11.40PM the lookouts reported an iceberg dead ahead and recommended an emergency evasion course. The ship couldn’t turn quickly enough and struck the iceberg a glancing blow which ripped a long gash down the starboard (right hand) side. She began to take in water. Due to the extent of the damage it quickly became apparent that Titanic would definitely sink, albeit slowly, and the order was given to abandon ship. However because of a major loophole in the maritime health-and-safety codes the ship did not have enough lifeboats for all the passengers. This was arguably the entire cause of the resulting tragedy because the ship took almost 3 hours to go down, the weather was very clement and another ship was rushing to their aid and arrived just a couple of hours later. If there had been enough lifeboats it would have been very easy to save all the passengers’ lives. But sadly of the 2223 souls aboard 1517 were lost, that’s 68%. The survivors, mostly women and children, were left with nothing but their story; no photographs were taken. The story has been revisited in countless books and films, like A Night to Remember in 1958 and Titanic in 1997. In 1986 Dr Robert Ballard led a team of marine archaeologists to find the wreck of the Titanic and explore it using submarines and robot probes. Since then the wreck has been thoroughly explored and even paying passengers have dived down by submersible to see it, including some of the survivors. Enter Robin Gardiner. A rather dour and pessimistic man who was a cleaner in the Theatres when I was a Porter there first told me about Robin Gardiner when we were discussing conspiracies. Gardiner was a friend of his who used to work with him before leaving to write full time. “Beats working for a living!” said my colleague with a hint of envy. I went on to explain to him that writing for a living is work, very hard work, but my pleas didn’t really register. I went online and discovered a plethora of capricious Conspiracy Theories spread over a number of websites regarding the sinking of the Titanic, but the basic premise was that the sinking had not been an accident; the ship had been secretly scuttled! Robin Gardiner is probably the world’s most famous proponents of this hypothesis. What’s more the ship that sank was not even the real Titanic, but Olympic! Their identity had been switched a few days earlier when the two vessels were shored up in neighbouring drydocks at Harland and Wolff in Belfast. Seeing as the two ships were almost identical this would have been fairly easy. All the conspirators had to do was exchange nameplates and colours. Olympic would then have put to sea with everybody thinking she were Titanic and then the ship would have been scuttled in mid-Atlantic. The scuttling procedure would have involved a carefully-faked near-collision with an unlit ship, later reported to be an iceberg, and the ship's ballast vents being jammed open to flood the hull. The crew and passengers could then be transferred to a third ship that came to the “rescue”. Gardiner’s evidence includes some eyewitnesses on deck who claimed to have seen the dark shape of an unlit ship nearby just before the iceberg hit. The motive for this fraud? An insurance scam. The decision to carry out this dupe was made by the White Star Line’s owner, the famous financier and power-broker, JP Morgan; it was motivated after Olympic was severely damaged in a collision with a Royal Navy cruiser. Morgan hoped to both get rid of his battered ship to save on repair bills, and claim insurance for the brand new Titanic at the same time. A very crafty plot that I’m sure somebody like JP Morgan would not have hesitated to carry out if he’d been able to, but Gardiner’s theory describes a model that could backfire in any number of ways with lethal consequences for those involved. A member of the HPANWO Forum, Footie McGrew has suggested that to see if a Conspiracy Theory is feasible or not we need to “model it”; imagine how it could be done and see if it would really work. If we apply Footie’s Law to Robin Gardiner’s idea what do we get? To scuttle the ship at sea would have involved recruiting Captain Smith and at least an entire watch section of the navigation and engineering officers and men. The damage control teams would also have to be briefed in. This would be necessary to fake the collision and the subsequent staged flooding. This is a very top-heavy conspiracy; what’s more it must have been worrying for the conspirators; so much so that I can't imagine at least one of them not getting cold feet and blabbing. What if the faked collision at high speed went wrong and Titanic really collided head-on with the other ship? There’s no guarantee that a neat little hole would be made to conveniently allow the vessel to sink slowly enough to launch the lifeboats. Ships have sunk in seconds sometimes; an impact like that would probably make Titanic one of them. This conspiracy would have been a potential suicide mission for everybody on board! Murder too, because of all the passengers; and one ethic that lies at the heart of a merchant sailor is that of concern for the welfare of the passengers. Any one of those men would have been trained to have lain down his life for just one of those people! How could so many of them possibly have been involved in a connivance that might get all of them drowned? Also I’m not a money-hungry blackguard like JP Morgan, but I’ve already thought of a much better plan for carrying out the conspiracy: Why not stage a fire at the shipyard to destroy the fake Titanic? After the ships’ identities had been switched a very small group of conspirators could have sneaked aboard and planted explosive and incendiaries. It has all the advantages and none of the drawbacks that scuttling her at sea would have. Much fewer people involved, no risk to the conspirators or innocent bystanders etc. Gardiner has to be wrong. So you see I don’t just blindly believe every Conspiracxy Theory. I’m not a “conspiracy nut” at all. In 1986 Robert Ballard, who had heard of the questions raised by Gardiner, took his submarine down to the Titanic’s dead hulk and examined the screws at the aft of the vessel. The screws of all of White Star’s ships was embossed with the vessel’s unique number and switching that in a single night in Belfast would have been impossible. The number embossed on the screw-blade of the wreck was indeed Titanic’s… Unless Ballard is in on the conspiracy too, 74 years later! What do you say, Robin? A while back, I read somewhere that a big part of the birth of the Titanic "conspiracy" was caused by Titanic's propeller shaft serial number being that of the Olympic or vice versa... something like that anyway! I've never really looked into it that much, so I can't say. Nice post & keep up the good work! Hi TSG. Thanks for your comment. If I see Robin Gardiner I'll mention what you said. I too believe that they never got to the moon. All the footage were merely a photographic trick. It is hard to digest that they went back to earth just because of the presence of Alien forces on the moon. That sounds not only funny but ridiculous. After so much of safety and precautions, they did nothing but scared and ran away to earth. Did you know you can shorten your long links with AdFly and get money from every click on your shortened urls. Start following our signals today & profit up to 270% a day. Nikola Tesla- as Close as it Gets!